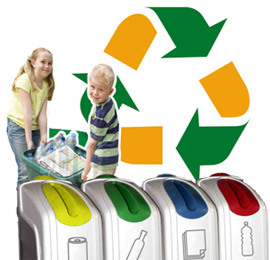 Ecobas 3R understands that Chilean communities need a cultural change to accept and approve a Recycling Program. People need to learn how to recycle, reduce their waste and how to start an Environmental Protection Program. Therefore, in order to develop the habit of recycling, Ecobas 3R carries out a complete environmental recycling education program which includes Seminars, Workshops, Teaching and Training courses addressed to schools..
Ecobas 3R educates children of schools which have been enrolled in the program in many practical ways implementing attractive extra-curricular activities with campaigns of collecting recyclable articles, games and plays environmentally oriented and carrying out ecological contests in order to stimulate environmental awareness and protection of our environment since an early age.